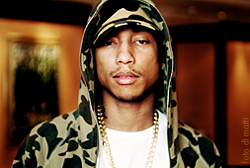 Pharrell Lanscilo Williams is an American singer-songwriter, rapper, record producer, and film producer. Williams and Chad Hugo make up the record production duo The Neptunes, producing soul, hip hop and R&B music. He is the lead vocalist and drummer of the rock-funk-hip hop band N*E*R*D, that he formed with Hugo and childhood friend, Shay Haley. He released his first single, "Frontin'", in 2003 and followed up with his debut solo album, In My Mind in 2006. His second album, Girl, was released on March 3, 2014. This album was preceded by the commercially successful single, "Happy". As part of the Neptunes, Williams has produced numerous hit singles for various recording artists.